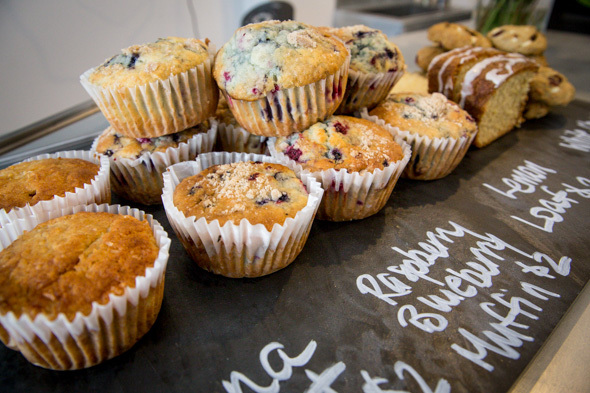 Kaffebar is adding a cachet of cool to the more desolate side of the Junction east of Keele. A little over a week old, this small, Norwegian-inspired coffee bar embraces Scandinavian minimalism and simplicity, offering a hip yet welcoming spot in the area to get caffeinated. 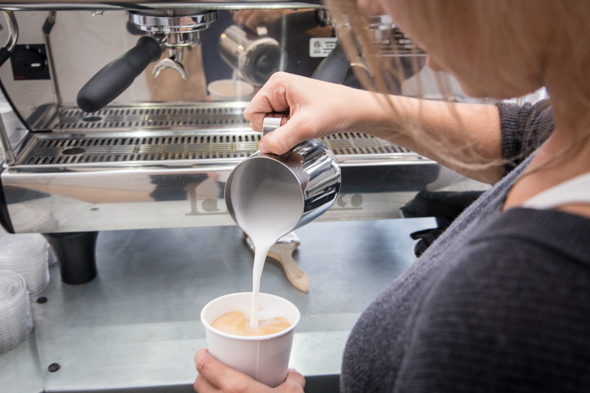 Owner Kim Samuelsen has wanted to have her own cafe ever since she was slinging coffee as a student ("Starbucks put me through school"), although she originally thought it was something she'd eventually do in her retirement years. She realized it was silly to wait that long (she's nowhere near retirement age), so when she found this space on Dundas St. W. a few months ago, she took it. She gave her notice at the finance consulting firm she'd been working at for the past two-and-half years and hasn't looked back since. 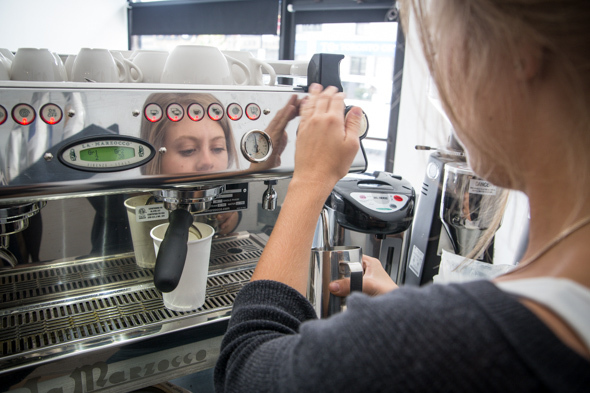 It was a bit of a scramble to have her La Marzocco GB/5 arrive in such a short time frame as the machine is handmade in Florence, Italy, but it all worked out somehow, because there it stands in all its shiny glory. 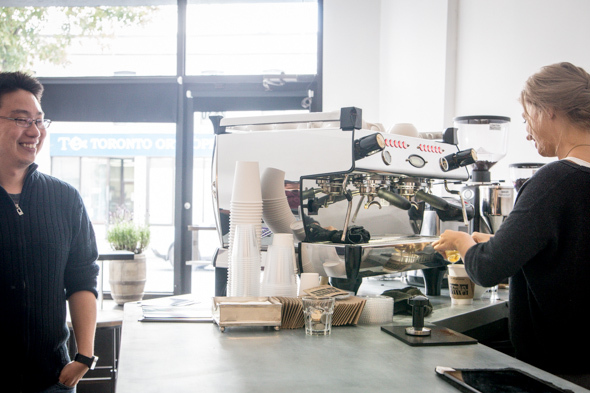 Samuelsen is serving a simple menu of espresso-based drinks using the Big Bro blend from Pilot Coffee Roasters , and the prices of these default double-shots have no intention of alienating the neighbourhood. The most expensive item in the joint is a mocha, at $3.75 (all prices include tax). 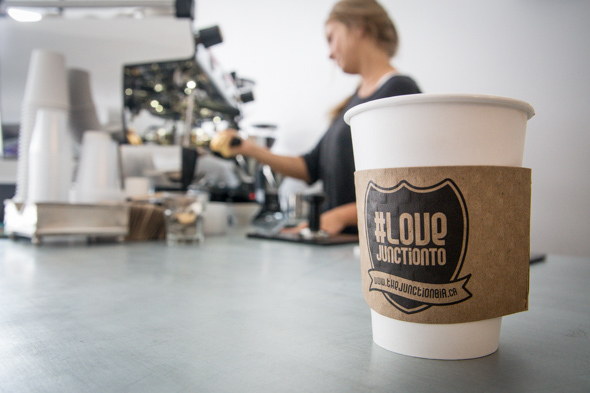 An espresso is $2.25, an Americano can be had for $2.50 and lattes go for $3.50. There are also Tealish teas available ($2) and hot chocolate ($2.50). 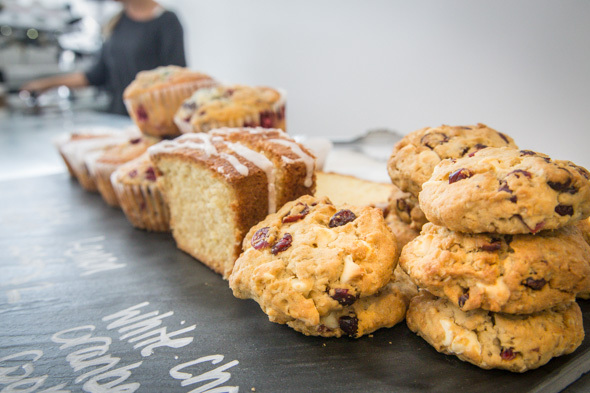 All the baked goods are made by Samuelsen herself in a hidden back kitchen, with a changing selection of cookies, muffins, and slices of cake priced between $1.50 and $2. 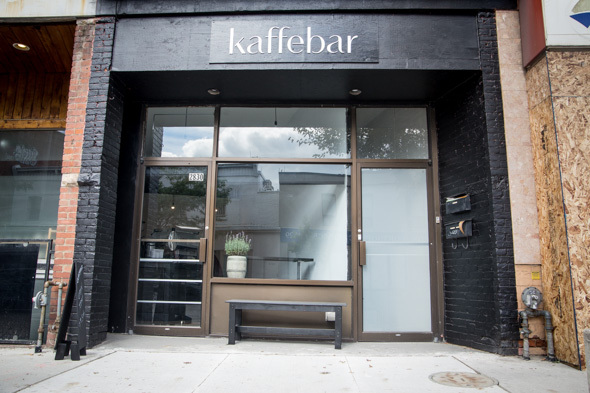 Samuelsen's parents are originally from Norway, and if you couldn't tell from its name, Kaffebar is definitely influenced by their homeland. On weekends, Samuelsen will make cardamom-laced treats (Scandinavians love their cardamom) she grew up baking with her mother, like cinnamon buns, heart-shaped waffles and skolebrĂ¸d ("school bread"), which are sweet buns filled with vanilla custard and topped with shredded coconut. Samuelsen makes good use of the narrow, rectangular space that was once a Harley Davidson service centre, intentionally choosing to place a long counter lengthwise across a greater amount of area - as opposed to a shorter one in the back - to encourage more interaction with her customers. For the time being at least, Samuelsen is the lone barista at her shop, and she's loving every minute of it. Although only a week in, she already has some regulars and is enjoying the process of settling into the community. It's quite a change from her previous career in finance. "This doesn't really feel like work," she says. Maybe this qualifies as early retirement after all. Kaffebar is open seven days a week, from around 8am to 5pm-ish.